Step 1: Once you are over with software download and installation process, select the scanning option from the menu bar; Quick Scan if corruptness intensity is low and Deep Scan if BKF file is damaged to large extent. Step 2: The software will ask you to load the corrupt BKF file and will start the scanning process. Once the process is over, the software will display a list of recovered items in the left panel. Step 3: To view content of the selected file, double click on the folder in let panel and the software will display related information in the right panel. Click on "Actions" to select range scan option that will enable you to extract data from damaged backup files. 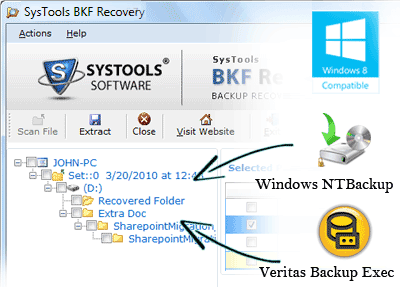 This will let you retrieve backup data from within a particular range.